Understanding and influencing whole-animal physiology and behavior with engineered gene delivery vectors, tissue clearing, and optogenetics by Viviana Gradinaru, Ph.D.
Viviana Gradinaru, Ph.D., from the California Institute of Technology CALTECH, Pasadena, CA, will be receiving the 2018 Gill Transformative Investigator Award. 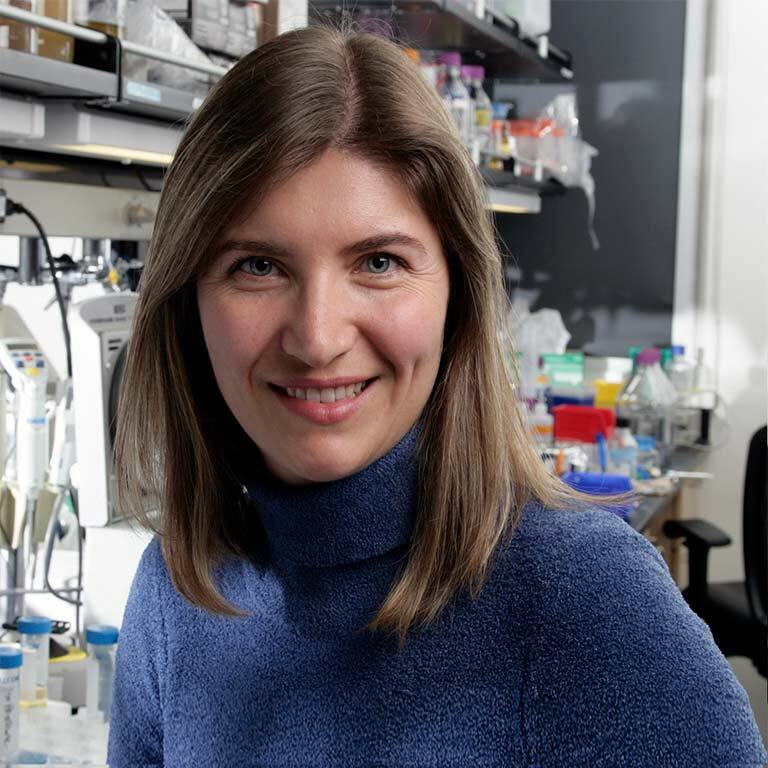 She will be presenting a lecture at the Symposium entitled: Understanding and influencing whole-animal physiology and behavior with engineered gene delivery vectors, tissue clearing, and optogenetics. Abstract: Our research group at Caltech develops and employs technologies that enable functional and anatomical access to the vertebrate nervous system. Examples include optogenetics, tissue clearing, and viral vectors that allowed us to gain new insights on circuits underlying locomotion, reward, and sleep. We showed how bidirectional manipulation of mesopontine cholinergic cell bodies exerted opposing effects on locomotor behavior and reinforcement learning and how these effects were separable via limiting photostimulation to PPN cholinergic terminals in the ventral substantia nigra pars compacta or to the ventral tegmental area, respectively (Xiao et al, Neuron, 2016). In most recent work (Cho et al., Neuron, 2017), the group has delineated novel arousal-promoting dopaminergic circuits that might be at the root of sleep disturbances common to numerous neuropsychiatric disorders. Genetically encoded tools that can be used to visualize, monitor, and modulate mammalian neurons are revolutionizing neuroscience. However, use of genetic tools in non-transgenic animals is often hindered by the lack of vectors capable of safe, efficient, and specific delivery to the desired cellular targets. To begin to address these challenges, we have developed an in vivo Cre-based selection platform (CREATE) for identifying adeno-associated viruses (AAVs) that more efficiently transduce genetically defined cell populations (Deverman et al, Nature Biotechnology, 2016). As a first test of the CREATE platform, we selected for viruses that transduced the brain after intravascular delivery and found a novel vector, AAV-PHP.B, that transduces most neuronal types and glia across the brain. We also demonstrate how whole-body tissue clearing can facilitate transduction maps of systemically delivered genes (Yang et al, Cell, 2014; Treweek et al, Nature Protocols, 2016) and how non-invasive delivery vectors can be used to achieve dense to sparse labeling to enable morphology tracing in both the central and peripheral nervous systems (Chan et al, Nature Neuroscience, 2017). Since CNS disorders are notoriously challenging due to the restrictive nature of the blood brain barrier, the recombinant vectors engineered to overcome this barrier can enable potential future use of exciting advances in gene editing via the CRISPR-Cas, RNA interference and gene replacement strategies to restore diseased CNS circuits. In addition to control of neuronal activity we need feedback on how exactly the tissue is responding to modulation. We have worked on two related topics: optical voltage sensors and imaging of single molecule RNA in cleared tissue. We used directed evolution of opsins to make them better at reporting action potentials (Flytzanis et al, Nature Communications, 2014). Changes in RNA transcripts can also report on activity history of brain circuits. Preserving spatial relationships while accessing the transcriptome of selected cells is a crucial feature for advancing many biological areas, from developmental biology to neuroscience. Collaborators and us reported on methods for multi-color, multi-RNA, imaging in deep tissues. By using single-molecule hybridization chain reaction (smHCR), PACT tissue hydrogel embedding and clearing and light-sheet microscopy we detected single-molecule mRNAs in ~mm-thick brain tissue samples (Shah et al, Development, 2016) and by rRNA labeling we mapped the identity and growth rate of pathogens in clinical samples (DePas et al, mBio, 2016). Together these technologies can enable high content anatomical and functional mapping to define changes that affect cell function and health body-wide.